Mercedes-Benz launched its first electric-powered Citaro commuter bus to the media in Stuttgart recently. Heavily disguised and not as pretty as it will likely look when it is officially launched at the IAA CV Show in Hanover later this year, the Head of Engineering at parent company Daimler Bus, Gustav Tuschen said that while all at Mercedes-Benz was excited to bring a new product to the market the company was determined to be the best, not the first. Although the electrified Citaro is not yet ready for service or delivery to customers, there are currently twelve prototypes on pre-production test programmes at different locations, including the Arctic circle and warmer parts of Spain. Mercedes-Benz is aware that other manufacturers have arrived sooner with similar alternatively powered products, Gustav feels that any such rush into this select marketplace could compromise on quality. 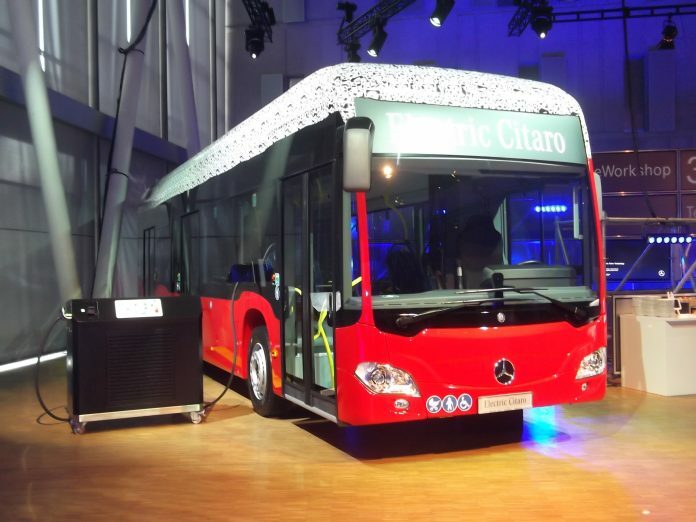 The German brand is looking to a time to when 75% of city buses will be zero emission, and by its calculassions, it should happen by 2030. By 2025, it is estimated that there will be parity between diesel and electric. A big challenge therefore for the future for all manufacturers further developing the new technology as fast as it becomes available.